Lemon bars, lemon bars!! These are Dave’s f-f-favorite dessert in the whole world. Well, next to ice cream of any flavor. I’ve botched experiments in the past trying to come out with lemon bars close to the same texture and taste as “conventional” lemon bars. It’s taken me many trials, but this is it I think! These come inspired by a patient who made these for a church function from a recipe she had found in another paleo diet cookbook. I’ve made my own crust layer and altered the lemon layer to be Advanced Plan. The original recipe called for honey. These are must-make bars! They haven’t lasted long in our home.. Once Dave’s nose got whiff, half the pan was devoured! And that makes me happy. 1.) Preheat oven to 350 degrees. Line an 8-inch square baking dish with unbleached parchment paper. 2.) CRUST Combine the almond flour, powdered xylitol, and sea salt in a large bowl. In a medium bowl, stir together coconut oil, butter and vanilla extract. Stir the wet ingredients into the dry until thoroughly combined. Press the dough evenly into the bottom of the prepared baking dish. Bake for 15 to 17 minutes, until lightly golden. 3.) LEMON TOPPING While the crust bakes, prepare the topping. In a blender or food processor (or by hand with a whisk), combine the almond flour, powdered xylitol, stevia, eggs, and lemon juice. Blend on Medium speed until smooth. Remove the crust from the oven. Pour the topping evenly over the hot crust. 5.) Pop back into oven. Bake for 15 to 20 minutes at 350 degrees F until the topping is golden at edges. Let cool in the baking dish for 30 minutes, then refrigerate for 2 hours to set. Sprinkle with extra powdered xylitol (optional). Cut into bars and serve. *The recipe for powdered xylitol can be found in Season’s Eatings Holiday e-Book on page 47. OH I can not wait to make these, we have a church picnic coming up this weekend and I wanted to have a spring time desert to pack with are alternative food! This will work wonderfully! Sounds like the perfect picnic addition! Enjoy! Ok I made these a today… My crust is not light colored like your pic, and it is very oily and crumbly. Also did it in an 8×8 and the topping is barley a 1/4 thick? HELP!! I cant take these to the picnic on Sunday! !They are not very nice looking or easy to dish up. :O( What went wrong? They taste have good taste, just not very thick or nice. Hmmmm, not quite sure what happened for you? First thought — what brand of almond flour did you use? And was it finely ground? That is key to most all my baking recipes. The almond flour must be a light fine texture, similar to wheat flour. If it’s more like an almond meal (coarse), you’ll get the oily crumbly results no matter what the recipe is (cake, bars, cookies….). For the filling, it’s not going to be all that thick. I think the way I angled the picture makes it look thicker than it is. You can of course double the filling though if you want! (Or 1 & a half it.) If it collapsed during baking, could be due to humidity of the day since it’s sort of an egg custard bake. Don’t give up! Give it another go before Sunday. Keep me posted my dear! I, too, made this and it turned out flat a couple of times. SO, I baked it in a round spring-form pan, and topped it with sliced strawberries after cooling to turn it into a kind of tart. Yummy! Hey Elise! We hope all is well with you guys! I am allergic to nuts so I was wondering if there is any sort of flour that is similar to almond flour. Hi Kristen/Cade. Finally getting to your comment, but glad we talked in person last week! I’d recommend brown rice flour, quinoa flour or buckwheat flour. All are Core Plan, but will behave the closest to Almond Flour. You’re not suffering from a major top 10 killer or struggling w/ toxicity, so your body can probably handle occasional whole grains. Just made these, and they turned out great! I grind my own almond flour using blanched almonds, and then I sift it. Makes it light and fluffy. 1 question for you, do you pack your almond flour into the measuring cup? On Elana’s blog she always does, so I do now too. I did when making these, so just wondering if you do. Thanks! Glad you like the recipe, Nora! I do pack my measuring cup. I don’t push down too hard tho. Just scoop up whatever fits in the measuring cup, then press down with my finger tips lightly to make more room, and top off with a bit more almond flour, then level off with my finger or knife. I almost always sift after this no matter what the recipe. Great question! Hi Andie, Well I can tell you I’ve never had them last long enough in my house to freeze any (my husband is a lemon bar fiend! ), but I don’t see why you couldn’t freeze them. You’d probably want to thaw out in the fridge over night (not at room temp, crust would get soggy). Oh Elise, these are my favorite desserts along with lemon meringue pie. I LOVE all things lemon. I can’t wait to make these. You are awesome!! I was wondering what the nutrition info was for these. Also what is the recipe for the powdered xylitol. I know you said it can be found in your book but I am unable to purchase it at this time. Thanks! I don’t post nutritional stats as it’s not personally important to me when eating a whole food diet. I let my body guide me. If you want to check, you can use a nutrition tracking website like MyFitnessPal.com. There are probably other free ones out there, but that is my favorite to recommend to my clients. Oh, these look so good! Can’t wait to try them! I do not have Xylitol in the house (because I have a dog that LOVES to get into everything!). What would you suggest I sub? THM Sweet blend? I do have that. I also have Erythritol, but the last dessert I made with it tasted off. Not sure if it was the Erythritol or my skills! Could you also make these using erithritol instead of xylitol? I found this recipe on Pinterest, and I make it at least once a week. It is incredible! The only problem is that the crust gets soggy in the fridge overnight or over a few days. It is just me eating lower carb in the house and I can only eat one or two bars a day :-). Can you give me any tips for keeping the crust crispy? Thank you! Hi Samara, The best two options I can think of for you are 1) slice the bars and freeze them. Pull out from the freezer 1-2 hours before you are ready to eat. 2) cut the recipe in half. Glad you enjoyed the recipe! 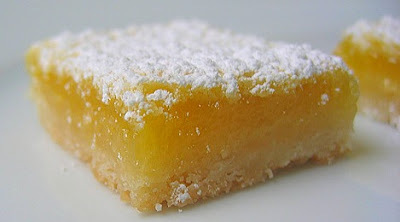 I’m sorry but these were the WORST lemon bars EVER. I’ve made “paleo” lemon bars before that tasted pretty good. These were way too sour and the crust was just gross. I had to throw them away, waste of expensive ingredients! I am making these for the hundreth time and switched my crust up, I used coconut flour. This is hands down one of my favorite sweet treats! I just made these tonight and am so impressed!! These taste amazing! I only wish that I had at least made 1/2 an extra making of the lemon filling. I didn’t realize that the filling was uneven in my pan so one side was thick and the other was too thin. My family usually doesn’t approve of the low carb desserts but this is a keeper! Thanks for sharing! My bars did not come out looking as nice as your photos but both my husband and I thought they were keepers. I am going to try a coconut cream version. Thanks for posting.